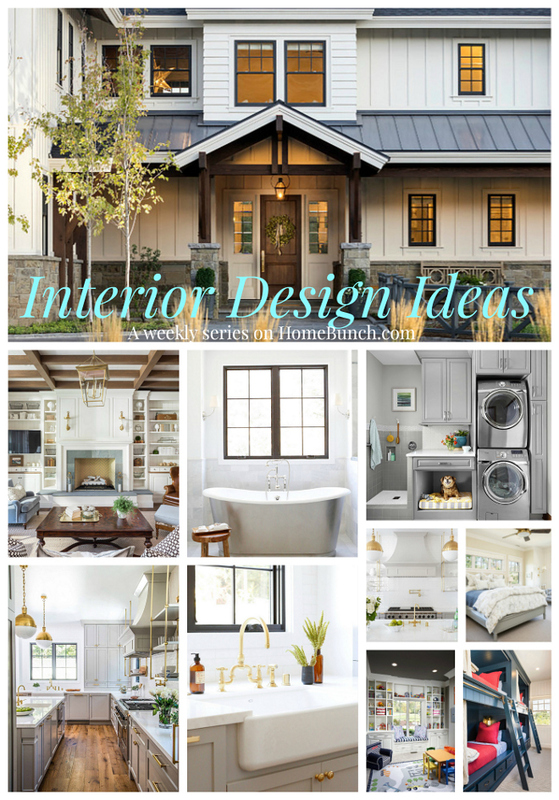 Take notes on many inspiring interior design ideas and sources shared by the designer! 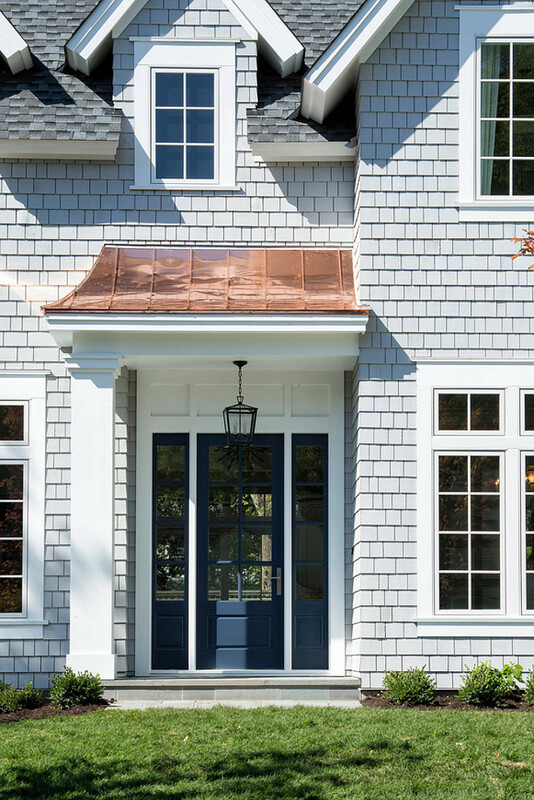 This Cape cod shingle-style home features a very appealing curb-appeal. Windows are Integrity by Marvin. Similar exterior paint color is Benjamin Moore Stonington Gray HC-170. The front door paint color is Hale Navy HC-154 by Benjamin Moore. Notice the copper roof. 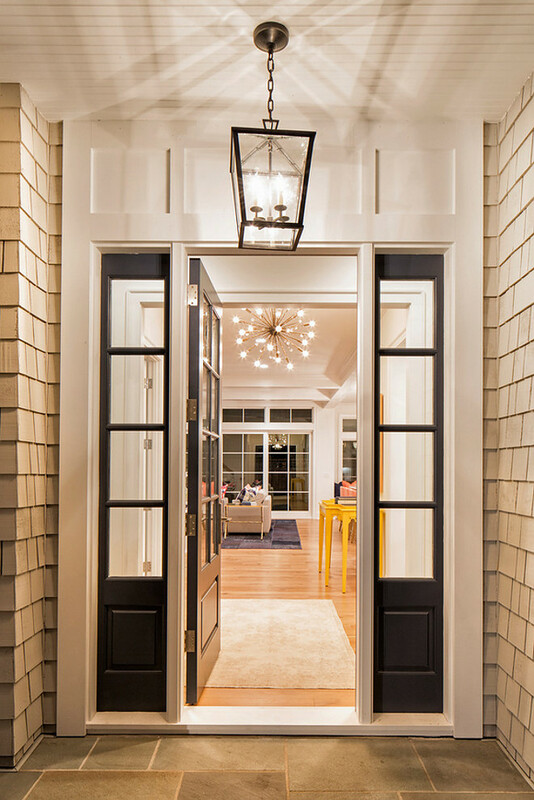 The front entry lighting is a medium Darlana Lantern from Circa Lighting. 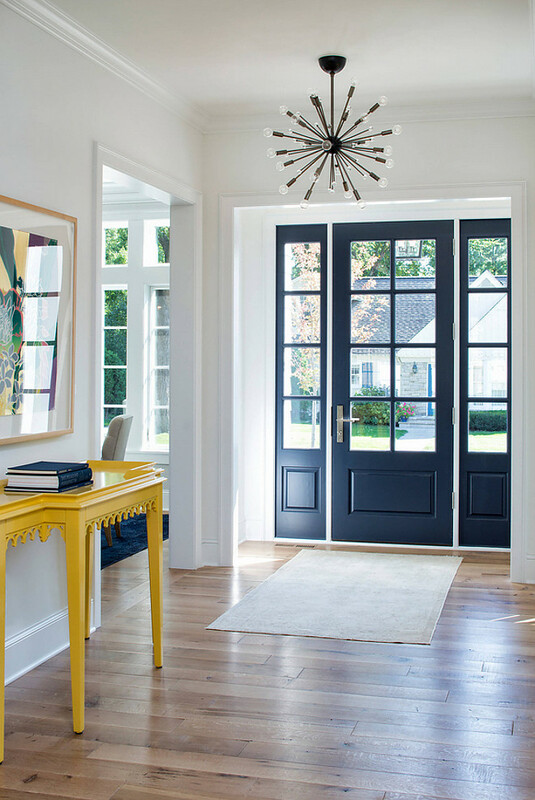 The designer chose to paint the interior of the door and sidelights in the same paint color; Benjamin Moore Hale Navy HC-154. 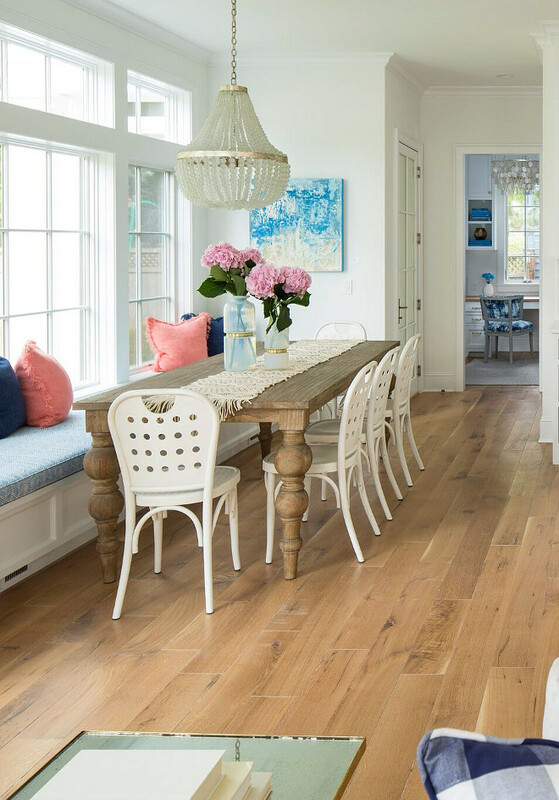 The paint color used throughout this home is Benjamin Moore Chantilly Lace. Table: Oomph Newport Console Table. The modern foyer lighting is from Arteriors. A formal dining room is located on the left side of the foyer. 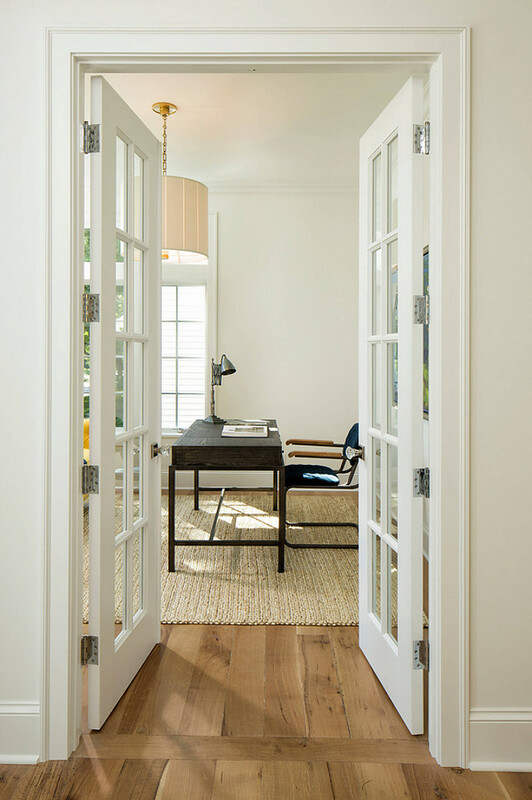 On the opposite side, you will find a home office with French doors and plenty of natural light. 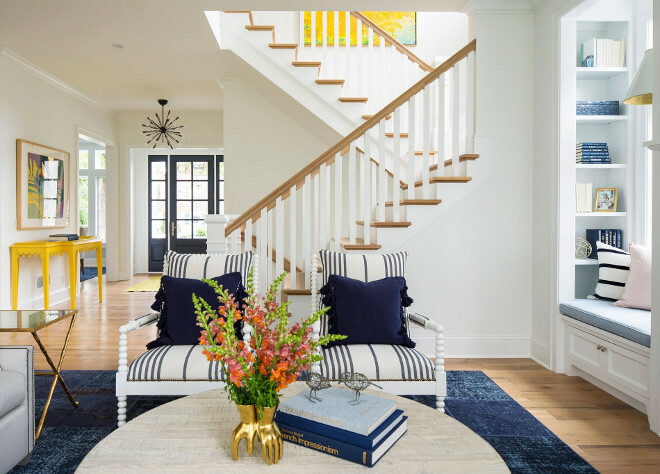 A yellow tufted sofa with navy throw brings some fun to this otherwise neutral space. 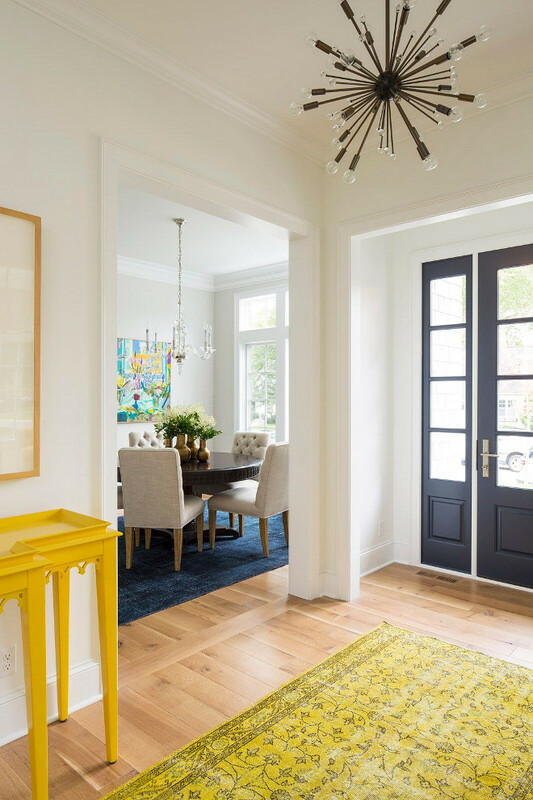 The navy and yellow color palette is carried to other areas of this home. Isn’t it fresh? The spindle arm chairs are from Lillian August with “Guiness” patterned fabric. 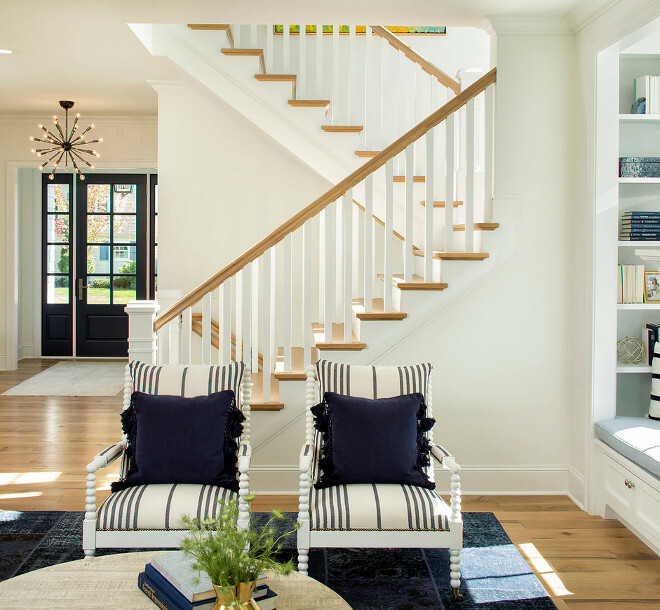 The spindle chairs are also accented with navy cushions. 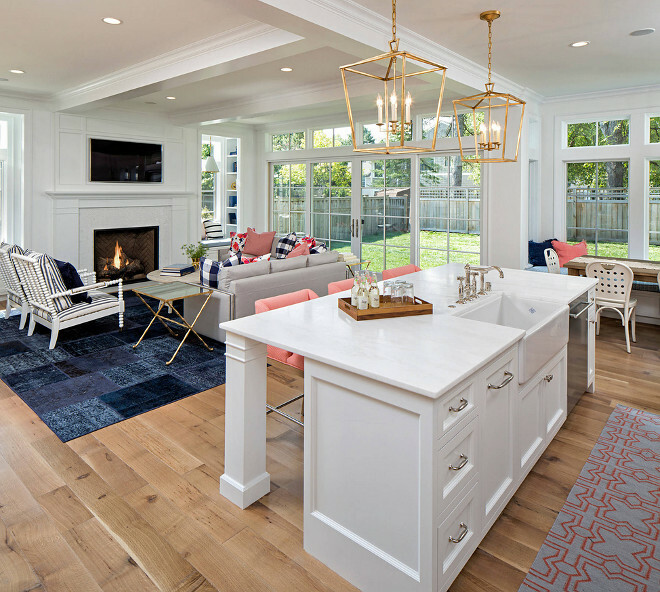 This stunning great room is equipped with an inset flat panel television mounted over a white fireplace mantle flanked by window seat reading nooks. If you look closely, you see that there are bookshelves on both sides of each seating area. 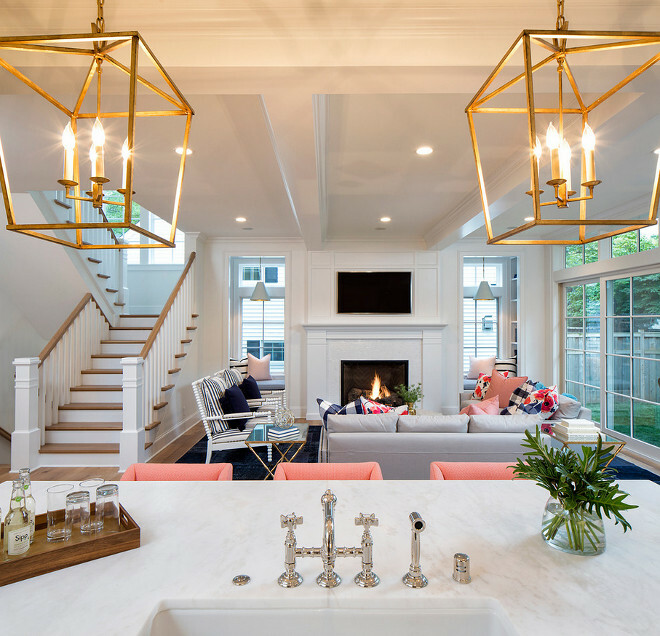 Pendants are Goodman Hanging Lamps from Circa Lighting. Fireplace Surround: Medium Brick Thassos – MN Tile & Stone. This room is roughly 20′ wide x 19′. 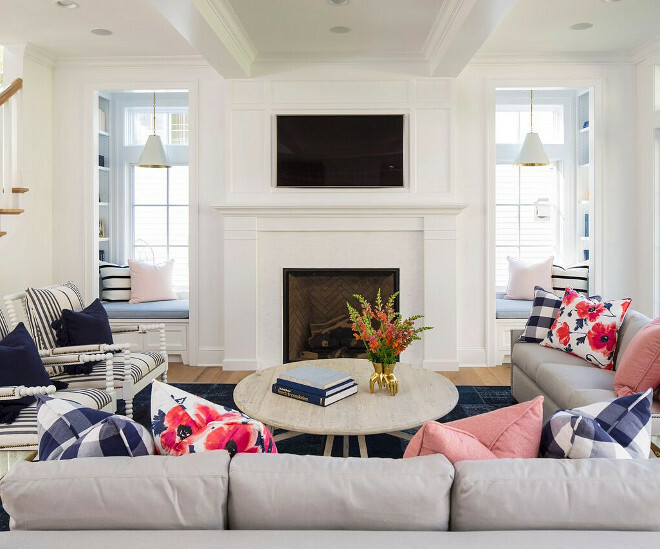 This gray and blue living room features a light gray sofa accented with nailhead trim and blue buffalo check pillows and pink and blue floral pillows. Decor: This patchwork overdyed turkish rug is truly stunning! The round coffee table is from Dovetail (similar). Dimensions: This great room with kitchen and dinette included is roughly 29′ long by 19′ wide. Navy Buffalo check pillows + Maraschino Poppy pillow + similar Pink Blush Pillow. 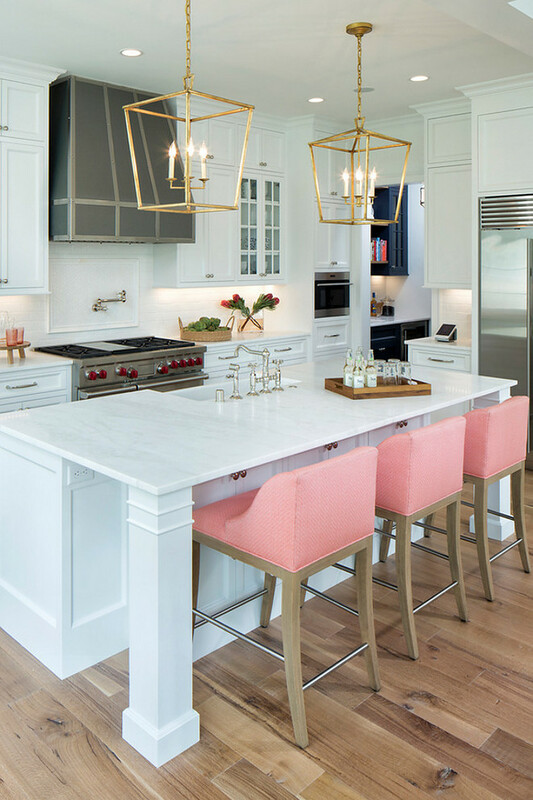 Three pink upholstered counter stools sit in front of a white wainscoted center island fitted with a sink and polished nickel antique faucet. 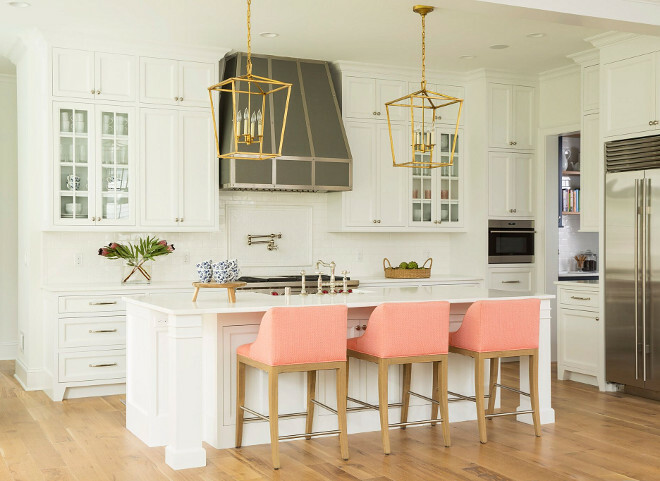 The paint color used on the cabinetry and walls is Benjamin Moore Chantilly Lace 2121-70. The floors are a Quarter Sawn White Oak flooring. Lighting is Medium Darlana Lantern in Gilded Iron. These custom Jessica Charles Stools. The fabric is by Link Outdoor. The color is called Melon and the pattern is called Tidal. 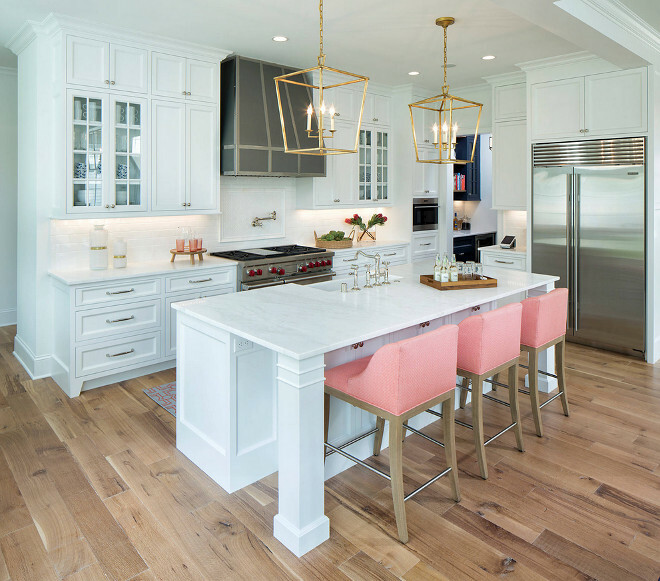 The kitchen countertop is Dover White Italian Marble. 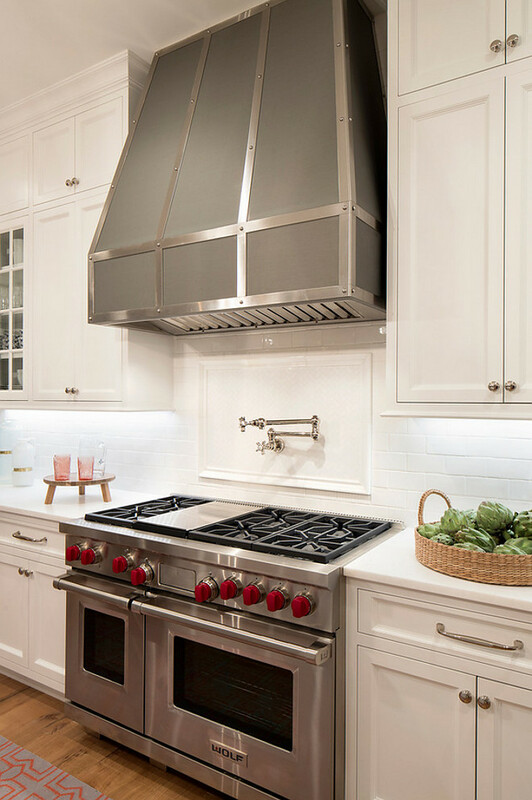 A gray metal kitchen hood accented with steel straps is mounted to all white subway tiles framing a white tiled cooktop backsplash finished with a polished nickel pot filler above a Wolf range. The backsplash is Glossy White Subway Field Tile. 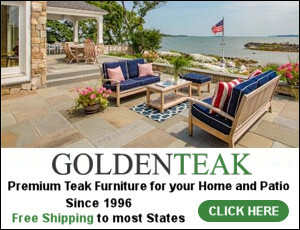 Island Dimensions: 48” x 108”. I simply love this kitchen nook! Isn’t it perfect? The dinette bench cushion fabric is French Blue Zig Zag by Quadrille Fabrics. Table is from Dovetail. Notice a workstation just ahead. 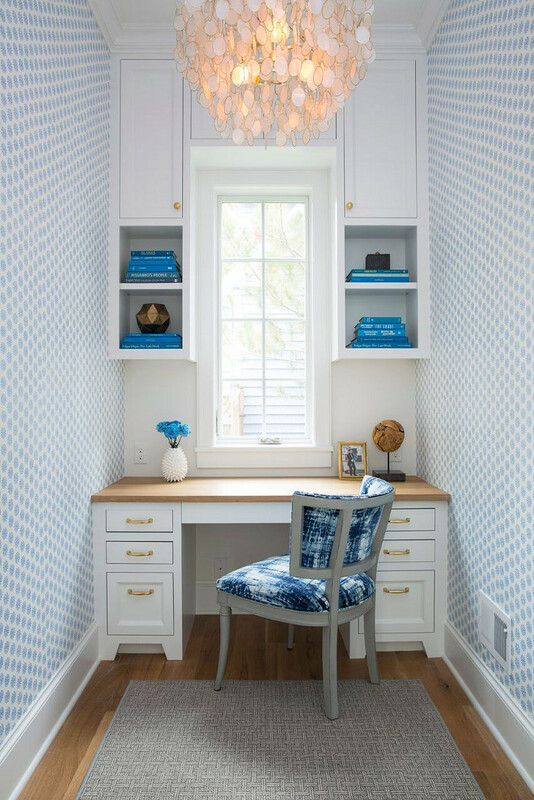 A blue tie dyed upholstered chair sits in front of a white built-in desk with gold pulls and wood desk countertop. The upper cabinets feature open shelves while the walls were covered in a blue block print wallpaper. Chair is from Hickory Chair. The boho table runner is by Anthropologie. 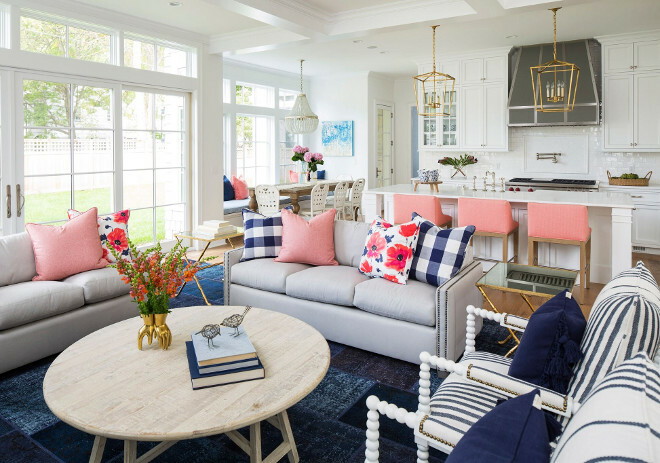 This kitchen nook also features coral and indigo linen pillows, milk glass and gold leaf flower vases. The butler’s pantry features a navy cabinet. Cabinet paint color is Benjamin Moore Hale Navy HC154. 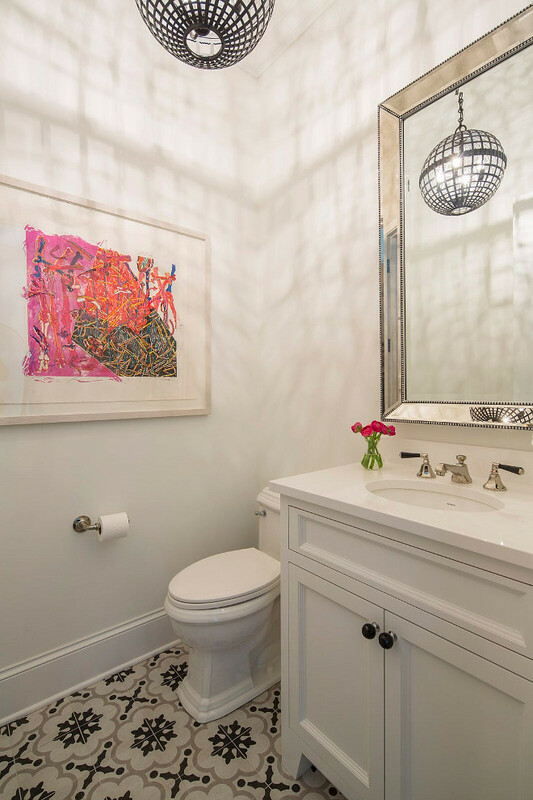 An iron sphere chandelier hung in front of a Restoration Hardware Beaded Venetian Mirror is mounted above a white single washstand with black knobs and a white quartz countertop and an oval sink. The floor is accented with gray and black cement floor tiles. The black and white cement tile was selected at Tile x Design. 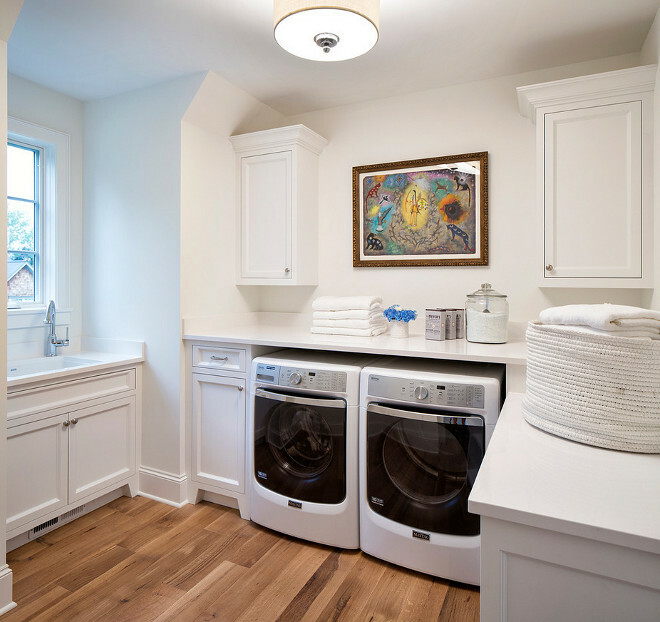 This gorgeous white laundry room, painted in Benjamin Moore Chantilly Lace, features hardwood flooring and white quartz countertop. 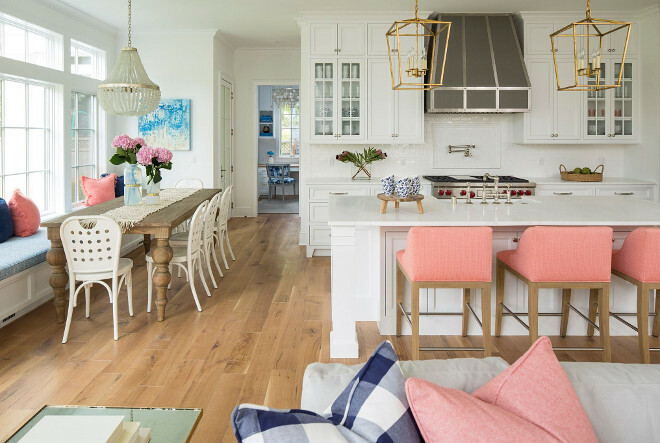 Soft Pink Paint Color: Pink Bliss 2093-70 by Benjamin Moore. 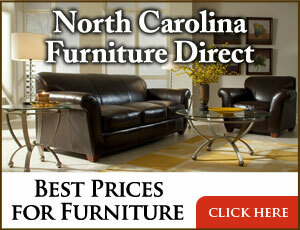 The bedframe and mirrors are from Dovetail and the dresser is from Universal Furniture. Illuminated by an Aerin Jacqueline White Chandelier, a cream tufted linen bed is dressed in white bedding, blue pillows and a floral lumbar pillow. The master bedroom paint color is Chantilly Lace by Benjamin Moore. Chairs are in a Bristol – Snow fabric. 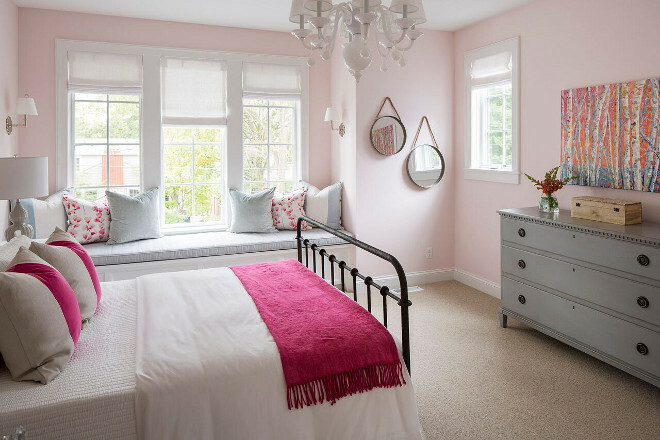 This bedroom features a pair of Worlds Away Marcus Lacquer Nightstands. The long lumbar pillow is covered in “Fancy Flower” fabric by Chivasso and the hot pink overdyed rug is by Fay + Belle. 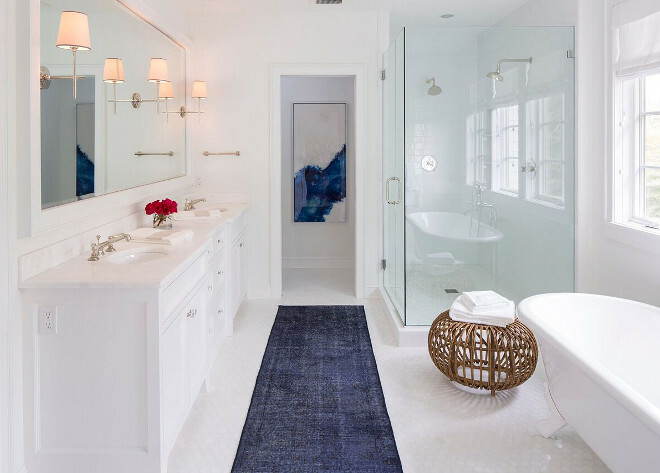 This white master bathroom with blue accents features a dark blue overdyed runner placed on glossy white hex floor tiles. Sconces are Thomas O’Brien Bryant from Circa Lighting. The vertical blue abstract art piece is Z Gallerie Sapphire Conduit 1. Paint color is once again, Benjamin Moore Chantilly Lace. The navy runner is a one-of-a-kind vintage turkish overdyed from Fay + Belle. Countertop is “Dove White” Italian marble. This is probably one of my favorite wet bars I’ve seen! It’s simple and classy. 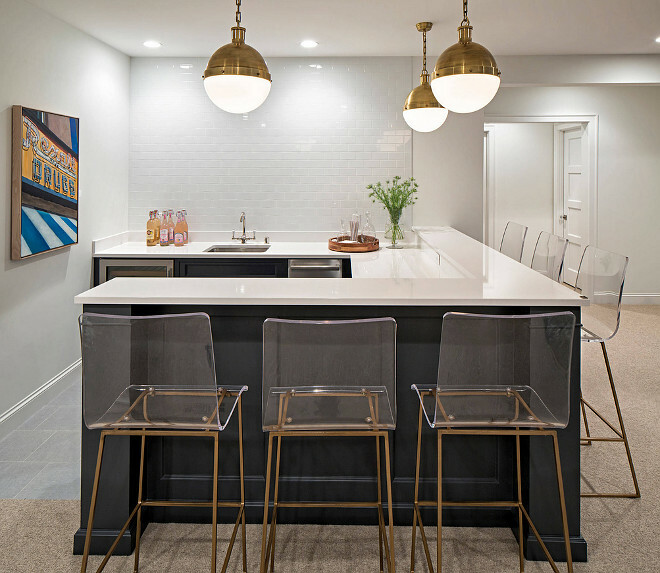 The basement bar is painted in a navy paint color; Benjamin Moore HC-154 Hale Navy and it also features white subway tile, Hicks Pendant lighting, white quartz countertop and Gabby Home Acrylic Bar Stools. Photos: Troy Thies, Photography & Landmark Photography. 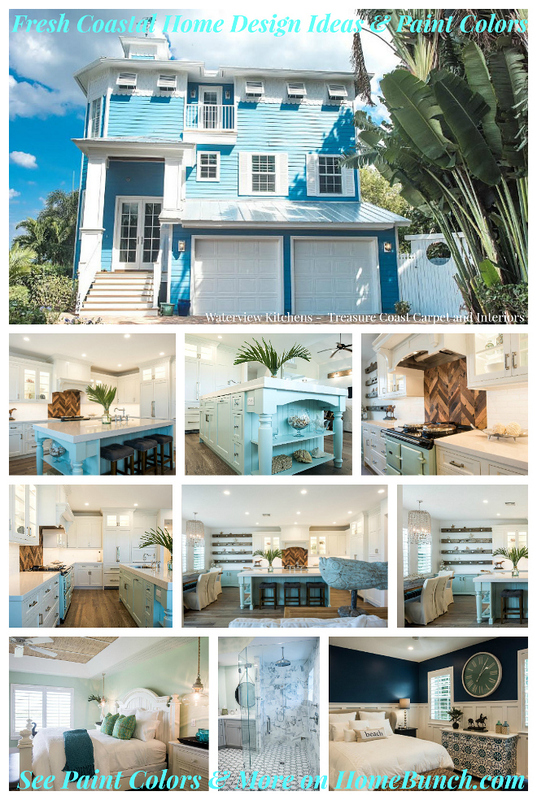 Tuesday: Fresh Coastal Home Design Ideas & Paint Colors. 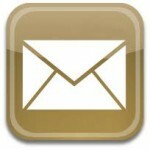 I have so much to do today… I’m designing a wonderful kitchen for a client in California and I need to review some plan. I absolutely love my client and trust the cabinet maker. I really can’t wait to see all of our designs come to life! I hope you have a wonderful day, my friends and we’ll talk again tomorrow!!! 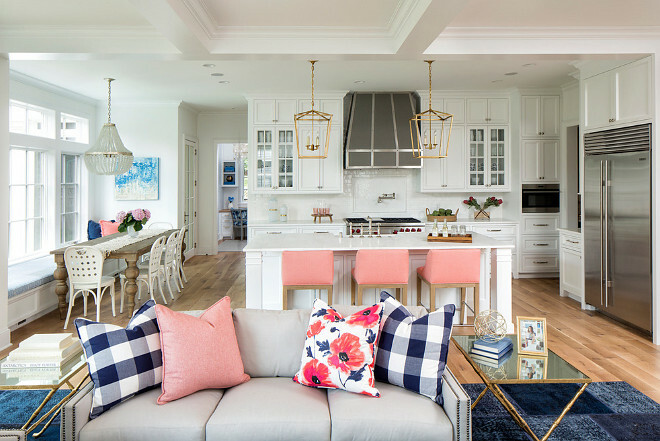 I love this home and the pops of pink are so fun! The stools in the kitchen are a favorite. Can’t wait to see the kitchen you are designing. Happy Thursday! How wide is the fireplace in the photos? Also how wide/deep are the shelves? Thank you! !